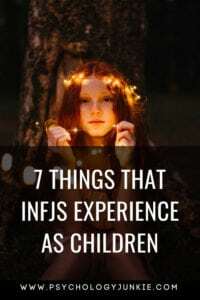 INFJ children are a rare and unusual breed. They make up less than 1% of the US population, and often report having felt “odd”, “misunderstood”, or ostracized as children. That’s why I think it’s especially important to have a grasp of what it feels like being in an INFJ child’s mind. If we can take the time to understand these children then we can improve their chances of accepting themselves and reaching their potential. Not sure what your personality type is? Personality Hacker has the most accurate free online personality indicator I’ve been able to find. Click here to take it. While the rest of the world seems to step out into their environment with certainty, easily believing that they will be supported by the walls, floors, and structures around them, INFJs second-guess everything. What is an illusion and what is real? What is the meaning beyond these concrete, tangible items? They want to transcend the material world, look beyond the senses, and beyond the limits of time itself to understand the over-arching meaning of everything. While most other children are focused on what’s happening now, INFJs are trying to figure out what “now” is in relation to everything else. In fact, what does it even mean to exist in “the now”? Childhood can be a magical time for any personality type. All children are blessed with imagination, and they are all still trying to figure out what’s real and what’s not. But INFJs tend to take longer than other types, especially sensing types, to discern what’s real and what’s not. It’s not unusual for INFJs to report that as children they wondered ceaselessly about the nature of reality and what their place was in the theater of life. What holds the earth in the sky? Why is it held there? Why was I brought into existence? INFJ children tend to take the role of “miniature philosopher” very seriously. While other children might be happy with the whole “dreams don’t make sense and that’s okay” line, INFJs don’t usually subscribe to that. Introverted Intuition, the preferred mental process of the INFJ, is all ABOUT unconscious symbols and imagery…that’s right, the stuff you find in dreams. Now I’m not saying INFJs are psychic, although many experience strange feelings that seem psychic. There’s nearly always a reasonable explanation for those feelings, though. Dreams, however, are taken very seriously by young INFJs. They analyze the symbols, the images, the underlying themes, and look for messages that might be important to them. In fact Carl Jung, the founder of personality psychology, referred to introverted intuitives as “the mystical dreamers and seers” of the world. INFJs tend to feel responsible for other people’s feelings, like they have to “fix it” if things are bad. This is thanks in part to their auxiliary function, Extraverted Feeling. At a young age this function isn’t very well-developed yet, so it feels overwhelming and stressful for young INFJs to tap into frequently. Young INFJs are so conscious of how other people are feeling that they can have difficulty understanding how they themselves feel. At times, this empathy can be a gift. They may know just what’s bothering someone and what to say to encourage them. Other times it can be a curse, and they can feel overwhelmed by emotions they don’t understand because they aren’t their own. This is one of the reasons it’s very important for parents of INFJs to give them plenty of alone time and to keep the environment as conflict-free as possible. INFJs are drawn to complexity on a constant basis. Remember how I said they don’t take anything at face value? Well, that certainly applies to their interactions with people. INFJs analyze what people are saying to them, always looking for hidden intentions, meanings, symbols, and significance. And if they’re on their own they can get so lost in their imagination that the outer world becomes silent to them. 1 – The young INFJ is so focused on analyzing what you said in the first two minutes of the conversation that they lost track of what you’re currently talking about. INFJs have a difficult time switching gears in childhood and adulthood. They like to fully immerse themselves in what they’re doing. They frequently get into a meditative, calm, focused state when they are analyzing, creating, or imagining. It’s as if the rest of the world goes quiet and everything seems peaceful yet alive. When someone bursts in on them during these times, they can seem annoyed, irritated, or overwhelmed. They may cast off their normally kind-hearted disposition and seem surprisingly harsh or sarcastic. That’s because when they’re in these states they are usually tapped into their dominant function, Introverted Intuition, NOT their feeling function, which comes second. Basically, it takes them a while to revert back to the “I’m around people, so I better tap into their feelings and their needs” phase. If you see a young INFJ repeatedly balling up the story they are writing, tossing it in the trash, and scowling furiously, then you might have caught a glimpse of INFJ perfectionism. Young INFJs have extremely idealistic hopes for the projects they create. Bringing their ideas out into the world is often stressful and time-consuming for them. They feel that the real thing “must” live up to their idealized image. It doesn’t help that they tend to have complicated, substantive projects in mind and not simple ones. They can re-work, throw away, modify, adjust, and correct their project so many times that they end up in a state of exhaustion. If you’re the parent of an INFJ, it’s important to give them some space when they’re working creatively. If they’re not happy with what they’re doing, continue to give them space, even if you feel like you must step in. INFJs tend to be very sensitive about their work and won’t want feedback until they are ready to ask for it. And they will ask when they are ready most of the time. When they do ask for feedback, try to be as positive as possible and give specific compliments, not generalized ones. If they want suggestions, be sure to mix criticism with praise for what they are doing well. Young INFJs soon discover that most of the world doesn’t operate in the same way that they do. Not every other child wonders about the nature of reality, why they exist, what this symbol means for that future, or what will happen in 50-100 years. Not everyone gets these sudden “hunches” about what will happen that they can’t explain because it hasn’t sorted itself out yet. INFJ visions, so clear inside their mind, often come across as halting or rambling in person. They may feel they know something very strongly, and feel as if they must tell someone about it, but then be met with ridicule, skepticism, or mocking when they finally do. Almost every INFJ I’ve spoken with has at one point in their lives come to a realization that their way of seeing the world isn’t generally accepted or understood. They often come to a point where they learn to keep things inside and they begin to question everything that comes naturally to them. It is extremely rare for young INFJs to find a like-minded individual who understands them, shares their feelings, and trusts their insights. You can find out more about INFJ loneliness here. It’s important for parents of young INFJs to take them seriously, to answer their questions, to not belittle their process or “rush them along” when they’re trying to explain an insight. With encouragement and open-minded acceptance INFJs can be catalysts for positive change in the world. What have your experiences been as a child? Do you have any thoughts to add? Let us know in the comments! Want to Find Out More About the INFJ? Check out my eBook, The INFJ – Understanding the Mystic. Want to Discover Your Child’s Personality Type? Check out my eCourse, Parenting by Personality Basics.